The Consulate General of the Republic of Korea in Milan chose the MIA Photo Fair, the international fair dedicated to art photography in Italy that will take place at The Mall Porta Nuova from 22nd to 25th March 2019, to introduce a focus dedicated to South Korean artists. 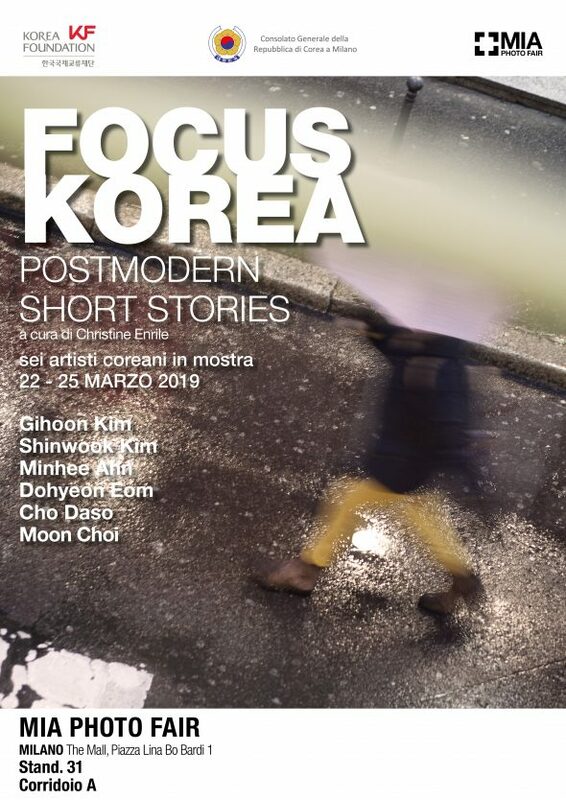 Focus Korea “Postmodern: short stories” is the title of the important exhibition project that will offer to the visitors of MIA Photo Fair a vision of the current state of contemporary photography in Korea. Art lovers and collectors will be able to deepen their knowledge of one of the most dynamic Asian countries, rich in history and traditions thanks to the internationality of the photographic language that allows the overcoming of any obstacle, even the linguistic one. The project conceived by the Consulate General of the Republic of Korea in Milan, realized thanks to financing from the Korea Foundation, curated by Christine Enrile founder and artistic director of c|e contemporary, was created with the aim of promoting the talent of young artists and to share the current reality of Korean contemporary art not with the Italian audience only. The exhibited works have been selected through a competition aimed at emerging Korean artists with a common denominator element that is to come from European countries. The jury, made up of professionals in the sector, worked taking into account the contemporaneity, the originality, the linguistic research and the effective communication expressed by each work, decreeing winners Gihoon Kim, Shinwook Kim, Minhee Ahn, Dohyeon Eom, Cho Daso and assigned a special mention to Moon Choi. The artists world vision, expressed in extraordinary photographs, has some recurrent themes such as the search of aesthetic models, the denunciation of mass stereotypes, reflection on state of mind, representations of emotional landscapes. Photographers, through their aesthetic, linguistic and technical research, implement generative systems of deep semi-narrative structures, realizing mechanisms of attention to differences, thinking on the derealization of the subject, on the loss of identity of a humanity conditioned by a global society and from mass information. They denounce mass stereotypes with scathing irony, giving us an interpretation of reality made of detour, reflections and overturning. We hope that the Focus Korea “Postmodern: short stories” will highlight all the energy, innovative power and cultural vitality of this country in constant growth through the medium that better than any other manages to interpret reality: the photography. (He was born in 1990 in Korea, graduated at the University of Design in Mokwon, South Korea he completes his education at the Haute École des Arts du Rhin, Strasbourg, France) He is a young artist who also works with video and performance. Kim Gihoon chooses the photographic medium to represent the derealization of the subject, the loss of identity of a humanity conditioned by a global society and by mass media. His introspective capacity and his sensitivity are reflected in the photographic images of individuals, of interior housing, of neighborhoods in the metropolitan suburbs in which they live in social minorities and weak groups. Portrait of no identity is his recurrent theme which formally underline his abstraction and synthesis capacity and humanly show his social-anthropological empathy. (He was born in Seoul in 1982, graduated in 2012 at the Fine Art Goldsmiths University of London, in 2014 he completed a master’s degree in photography at the Royal College of Arts) He is an artist who creates a personal introspective nocturnal dimension with the medium of photography, carrying out the mise en abyme in which a passage of threshold from the watchful state to the hypnotic one is incessantly duplicated. A visual example of this operative process can be read in the cycle of works entitled The Night Watch 2011-2017, which resumes, during the military service, one of its night-time solitary tours, in a border area between North Korea and that of the South. The state of exhaustion combined with the tension through it, crossing through a demilitarized zone, but at risk, bring him to mistake for a person a large tree trunk in which he has suddenly stumbled. From that moment his photographic shots resume, among dominant colours like green and violet, the ghostly aspect of the forest in which he roams like in a daydream. The night, the spectral light, which illuminates the edges of the tree canopy, gives to his work a Ghotic aspect which is attractive and psychic. Shinwook Kim is deeply drawn to the immaterial boundaries between different countries, from nobody’s land, from non-places, like airports and waiting rooms, theorized by Marc Augé, from the states of shift between the real and the imaginary. (She was born in 1991 in Cheong-Ju, Republic of Korea, she graduated in Art and Design at Shingu College in Sungnam-si, Department of Photography & Image Media, then she graduated from Kyungil University in Gyeongsan-si, South Korea, section of School of Photography & Motion Picture, completing her studies at the Bauhaus University in Weimar, the city where she lives and works, Germany) She is an artist who works with photography and the photographic set to denounce, with scathing irony, mass stereotypes related, in particular, to the dictates of fashion clothes, accessories, body worship, make-up, signs of standardisations to create a belonging to a group, such as excessive thinness, reconstructed nails, tattoos, piercings and other stratagems invented by the “beauty” industry. An industry that was born in the 1920s and progressed rapidly in capitalist societies, characterized by mass consumption. Her photographic cycle entitled Your Hands is hilarious and corrosive, in which the protagonists are, unpredictably, not the beautiful smooth and soft hands of a mannequin, but wrinkled crow’s feet with long nails glazed with red nail polish, plunge in a sea of ​​pearls or enriched with the brands of Gucci, Dior, Prada. Her appeal to glamour, to glitter, to Kitsch, raises the critical level of her provocative denunciation, correlating beauty and price elements and stimulating, in the viewer, the awareness of the level of influence suffered by the collective imagination. (She was born in 1987, Ulsan, South Korea, residing in Saint-Denis, France) She is an oriental artist who, living and traveling in a Western country, turns the spotlight to differences, to the Genius loci, of the country she crosses, like the city of Lisbon, in Portugal, where shiny ceramic decorated tiles are adopted for the outer walls of the houses, after a terrible earthquake in 1755. Those tiles called azulejos and characterized by a blue colour, usually decorate the kitchens and bathrooms of noble houses. The artist is sensitive for aesthetic and social reasons to this role that is overturned so that an interior decoration is used on the outside, she creates a photographic cycle on plexiglass, entitled Story on the Reverse of Lisbon in which a wall of azulejos is now approached to an internal portal, now a degraded floor or other situations. The communicative immediacy of this artist is also reflected in the dialogue between abstraction and figuration, detail and synthesis, temporal and spatial dimension. Dohyeon Eom defines Matière blanche, the immaterial components of her photographic work, such as light, air, the spiritual power of the Pope, the emptiness as absence. (She was born in Seoul, Korea, in 1969, she graduated in photography in 2011 at the European Institute of Design in Milan, she lives and works in Como), She’s a photographer sensitive to the seductions and tensions of the backstage during the Haute Couture fashion shows. Her great ability takes shape of resuming the still life, animating them with lights, shadows, moving effect, reflections, dominate by gray-blue colours. Currently, she is working on the Bi, rain cycle that has as its protagonist the rain, a natural element that constitutes an optical, mental, psychological crack, through which the artist interprets the reality. Beyond the liquid veil, which creates doubling, reflections, wrong impressions, overturning of the sky in the road puddles, listening to the white and relaxing noise of rain on the pavement and the roof. The rhythm and the scenery of the day change the intensity, opening oneself to reflection and unprecedented meditations. The rain, in the photographic sequences of Moon Choi, has the seductive power, beyond the physical impact, to give shape to a liberating, dreamlike condition, which brings the human subject back to the emotional potential of the childhood days.